We should probably talk about brakes. Maybe you like getting dirty and cleaning the wheels every week. I prefer just using a different brake pad the generate less brake dust and use my time to do other things. There is a lot of confusion about what types of brakes you should install on your vehicle. There are many variables in brake compounds and we could talk about it to death. Instead I wanted to only discuss three categories since that is what we here see most commonly on BMWs at BMW Excluservice. You have Economy pads, Premium pads and Premium Low Dust Pads. 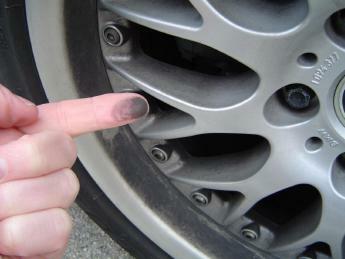 Lower grade pads tend to not last long and generate a lot of brake dust. The following brands usually fall into this category. Premium pads will last a little longer and will also generate brake dust. The following brands usually fall into this category. Premium Low Brake dust pads as the name implies will generate less brake dust. The following brand usually fall into this category. Below you can see that the higher quality “Akebono” Brakes are built differently. There is a divider that allows better heat dispersion and the material is made up of a ceramic compound that will generate less brake dust. 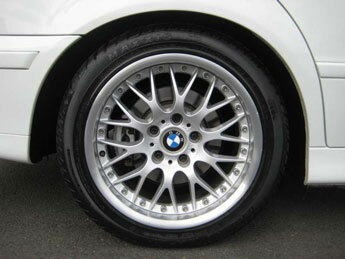 In Recent Years BMW has introduced their “Value Line” parts lines. If you look closely at a set of “Value Line” you will see that they are in fact made by Jurid, known in the industry as a lower quality brake pad manufacturer. It is my opinion that they did this in order to provide a lower cost pad to their dealers so their dealers could be more competitive with aftermarket/independent shops like us. We see this as a race to the bottom and have no interest in installing lower quality materials on our customers cars so we choose to Install Akebono and Textar as primary options. It means that while you may pay a little bit more for your brake pads, you’ll save time and money from having to wash the wheels all the time.